Luxury Antonovich Design - a design studio, where the masterpieces are created. The team of creative designers and talented architects and experienced builders who know everything about the art of creating unique interiors are engaged in this. To our valued customers in the world, we offer the supply of furniture and materials directly to the site. Preparation of the final specification of finishing materials, furniture, lighting, decoration, and accessories necessary for the implementation of the interior project. Services of designing interior turnkey, passing through all the steps to transform your home, apartment or office into a comfortable and cozy space you've always dreamed of. Every interior design, created by Turnkey interior design company Luxury Antonovich Design, - not just the perfect embodiment of the client's dreams, it's his "a little universe." Experience, professionalism, and creativity allow us not just to create exclusive interiors in Africa. We help customers to find their unique style, and we realize all theirs the unspoken desires. We know all about design art, so the result is always breathtaking. Luxury Antonovich Design Team is well acquainted any current interior styles. Designers recreate the elegant modern and luxury classic, functional minimalism and colorful, eclectic style, gentle Provence, and pompous empire style. The subtleties of the style will be respected to the smallest detail. Do you want to try something new? Only we create an interior design in Africa, in which different areas are in harmony, and this will make the design of the space is not just original, but exclusive. Creation of a unique interior - joint work, and client takes part in it. Turnkey interior design company Luxury Antonovich Design designers in the development of the project will be based on the customer's desires, his tastes, and preferences. Just tell us about your favorite colors and textures, how do you see the space of your home. Professionals will be based on this, offering a particular style, accessories, furniture, lighting, decoration. You do not have to wait to see "the interior of your dreams," you can have a sketch that will exactly meet all the wishes expressed. If you want to change something - not a problem, the primary task of the designers Luxury Antonovich Design - a result that will please you. Your dream about the perfect space will be realized masterfully. And we implement our perfect design projects. 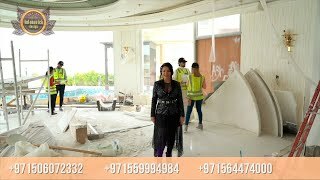 Turnkey interior design company Luxury Antonovich Design not only develops in UAE interior design but also recreates it. Construction company experts in a very short time perform repairs of any complexity. Room decoration will be performed following the sketches that provide designers, and they will monitor the work. Design project "come to life," space will be exactly the way you imagine. To decoration always uses the best materials, which will be selected in strict accordance with the stylistics. Designers will offer lighting fixtures, textiles, and furniture, which are not only organically complement the interior, but will appeal to your heart. Performing each client's wish - credo Turnkey interior design company Luxury Antonovich Design.